In case you didn’t notice, Carrell Farms is on the market this week. Last chance to order from them for the month of December! Ancient Awakenings has several gift baskets for sale this week ONLY. 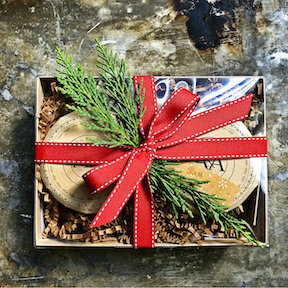 From a Fermented Goods Starter Pack to a Fermented Fanatic Basket, a Local Goods basket and a CBD basket, check them out under Gift Bags and Box Sets. Vegetables on the market include ginger, carrots, mushrooms, tumeric, spinach, tomatoes, many different varieties of lettuce, and much more! Indian Creek Angus is back on the market with a variety of grass fed beef products. Back in Time has just listed a new item, Chicken Bone Broth. This 24 oz container comes frozen to preserve nutrition. The “Certified Naturally Grown” Back in Time birds in this bone broth are locally grown in Barrow county on the “Back in Time” family farm. This is a reminder that their listings are available only on Wednesdays. ’Tis the season for a beautiful Heirloom Gardens wreath! Check them out in the holiday decorations section and order yours today. As of 8AM, there are NO EGGS on the market. I will send out an alert if/ when any get added. Vegetables on the market include carrots, swiss chard, spinach, tomatoes, many different varieties of lettuce, and much more! In case you missed them last week, My Daily Bread has a few new treats: eggnog poundcake, chocolate gingerbread cookies, and white chocolate raspberry muffins. Just in time for holiday baking, Georgia PECANS from Simply Southard are on the market, $11.50 for a 1 lb bag. 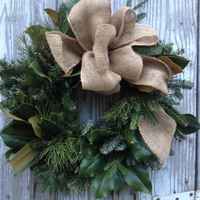 ’Tis the season for a beautiful Heirloom Gardens wreath! Check them out in the holiday decorations section and pre-order yours today. A&A Alta Cucina will be at the market this week with their award-winning sauces, jellies, oils and vinegars, as well as beautiful gift sets. If you haven’t yet, try the Cranberry-Orange balsamic vinegar. There are vegetables a-plenty this week, everything from tomatoes and peppers to tumeric and mushrooms, and nearly every leafy green in between. It’s the only place in town to get Romaine lettuce! Eggnog, white chocolate and gingerbread, oh my! My Daily Bread will have new sweets for us this week. In case you missed it, Back in Time Farm is back at the market, with Certified Naturally Grown pastured poultry products. They only list Wednesday only, so be sure to order early. Ancient Awakenings’ is on the market with their new seasonal kombucha flavor, Apple Cinnamon, as well as your favorite kombucha, kefir and cultured veggie flavors. B&A Bees has listed several new products, including honey and candles. Carrell Farms Alpaca, lamb and water buffalo. THE MARKET WILL BE CLOSED SATURDAY, NOVEMBER 24. Back in Time Farm is finally back at the market, and with a big announcement— their pastured chicken is now Certified Naturally Grown! In addition to pasture, their birds are provided an organic feed and supplemented with organic wheat and corn. Back in Time Farm has many new poultry products as well as your favorites. Ancient Awakenings has your favorite kombucha, kefir and cultured veggie flavors. What’s NOT on the market this week? Many veggies. The decreased daylight, recent rain, and several nights of low temps have slowed their growth.